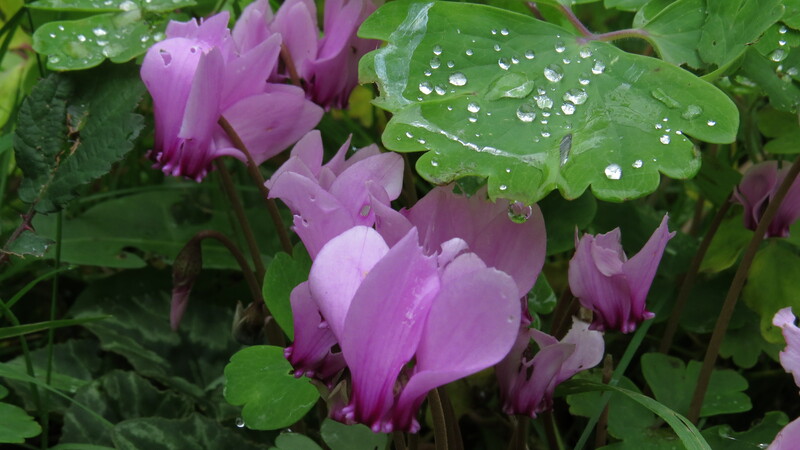 Dear Readers, I have always loved cyclamen – there is something about the way that the petals stream ‘backwards’ that remind me of the wings of a bird as it lands. At this time of year you can see lots of naturalised cyclamen in hedgerows, parks and other dryish places (the photos this week were taken in my Aunt Hilary’s Somerset garden). The plants have been showing their cherry-blossom flowers in the UK since 1597(they are originally from the area around the Mediterranean), and have been here long enough to acquire a vernacular name – ‘Sowbread’. There are variations on this name in several of the European countries from which the plant came: ‘pain de porceau’ in France, for example – and this is presumably because the pigs ate the tubers when they were rooting in the woods in autumn. At first glance, it’s difficult to imagine what plant family cyclamen belong to, but if you look into to the lower part of the flower, where the stamens are, you’ll see that it looks rather like the middle of a primrose. And this is the family to which cyclamen has finally been allocated, after a brief flirtation with the Myrtles, a most unlikely place for this plant to end up. Genetics has solved a lot of strange taxonomical anomalies: when I was growing up, giant pandas and red pandas were placed in a family together, even though they shared few obvious similarities. What a relief when geneticists discovered that giant pandas were exactly what they looked like – bears – and popped them back with the rest of the family. Though I imagine it made no difference whatsoever to the pandas, who just carried on munching the bamboo. 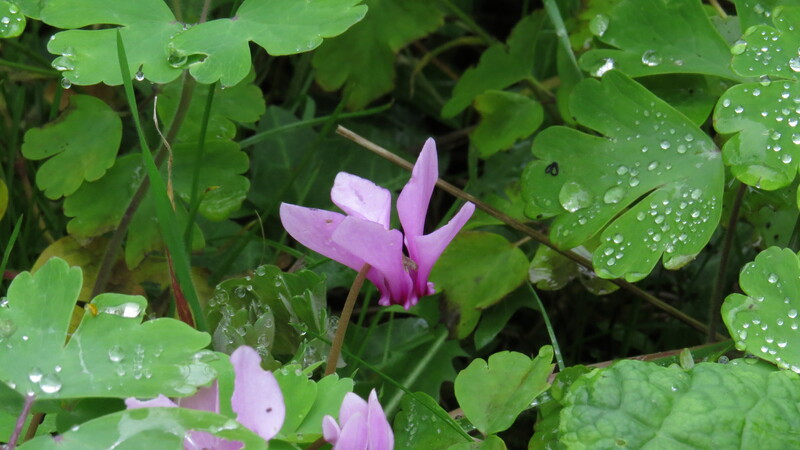 There are 23 species of cyclamen in total, but the one that is naturalised in the UK is Cyclamen hederifolium. One reason that the plant is so valuable in a garden is its very late flowering: the leaves and flowers die back completely during the spring and summer (probably a mechanism for avoiding the worst of the Mediterranean heat) and then reappear, almost miraculously, in the autumn. 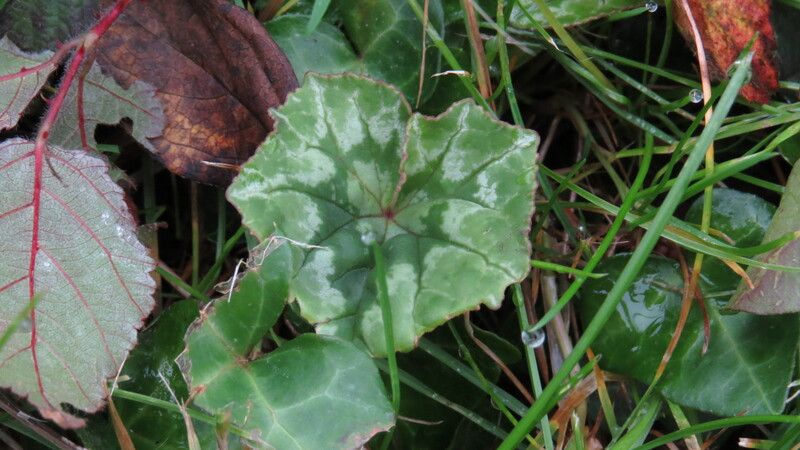 The leaves themselves are exquisite, heart-shaped and patterned in cobweb-white and the palest of green, and the species name ‘hederifolium’ means ‘like the leaves of the ivy’. I can see the resemblance. 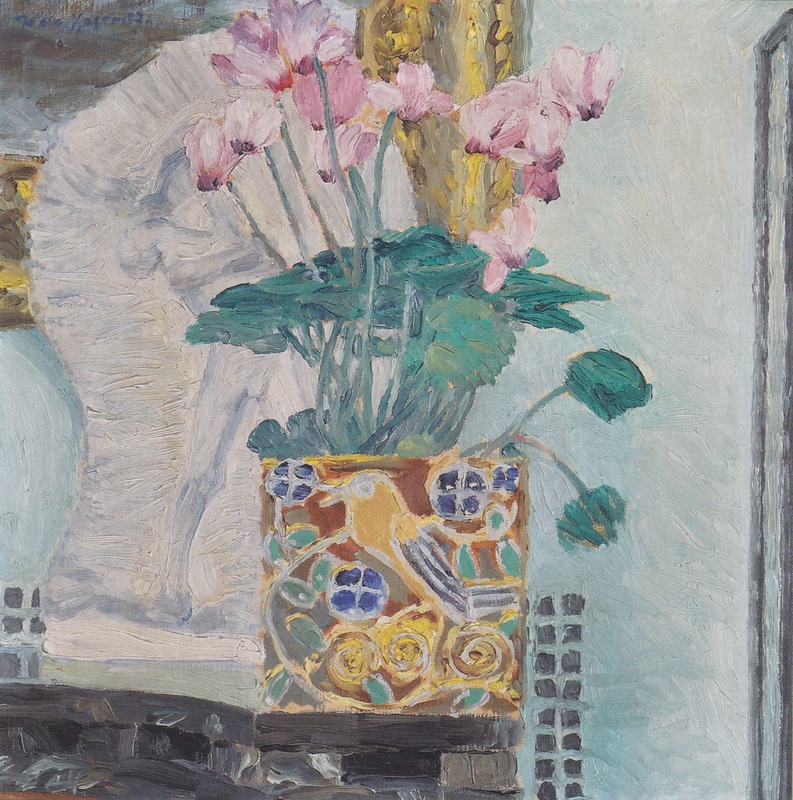 ‘Cyclamen’, incidentally, comes from the Greek word for ‘circle’. 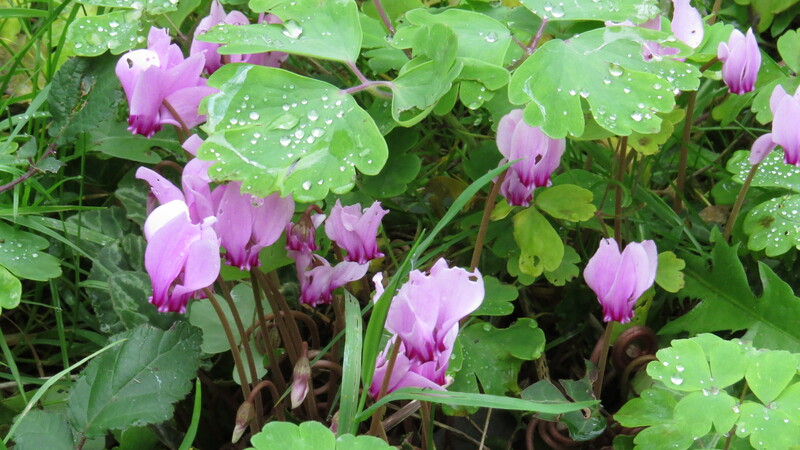 Many sources rather prosaically mention that this is because the tubers are round, but I wonder if it is because of the way that cyclamen appear, flower and disappear in a circle of life. As they can be remarkably long-lived plants (up to a hundred years) I wonder if they seemed both mysterious and eternal. 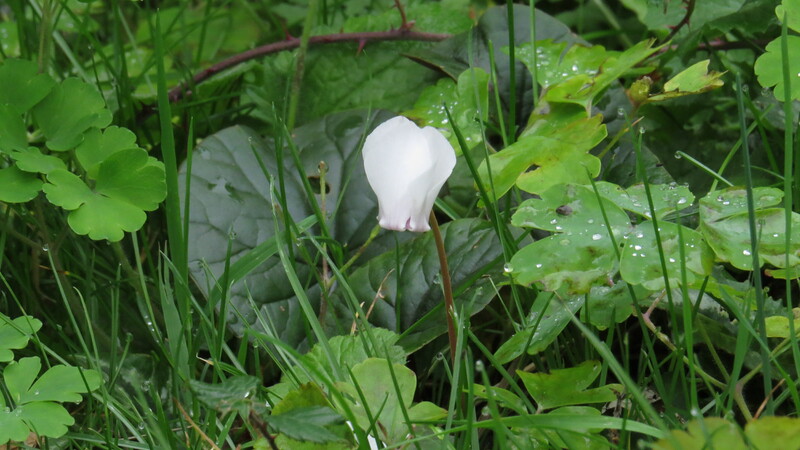 Although the flowers are usually pink, there is occasionally a white one. The tubers of cyclamen were used in a variety of ways. In ‘A Modern Herbal’, it is suggested that a tincture of the root, applied as a liniment, would cause ‘purging of the bowels’ (so stand well back!) Juice from the root is said to be poisonous to fish, and an ointment made from the tuber is said to expel worms. All in all, the action of the plant seems to have been about getting various things out of the body which shouldn’t be there. 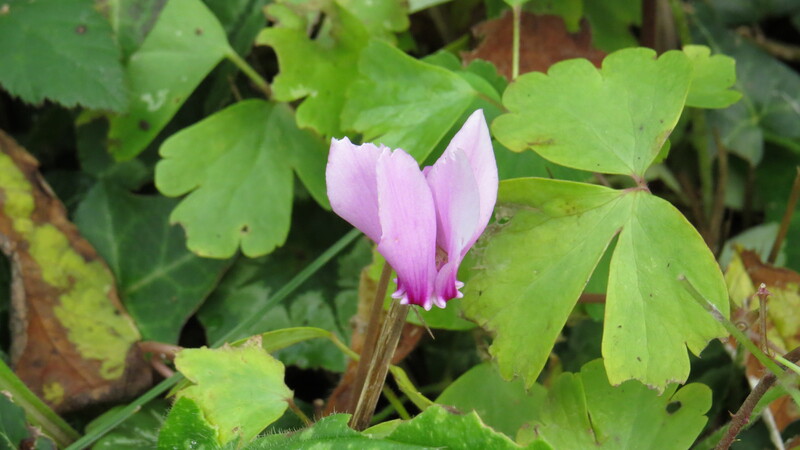 Given that the root of cyclamen has such purgative qualities, and that it also contains saponin, a most unpleasant-tasting chemical, I was surprised and pleased to find that there is one recipe which uses cyclamen leaves rather as vine leaves are used in dolmades in Greece. The History of Greek food website is a great source of information on the uses of many of the foods of this area, and for a Fava Stuffed Cyclamen Leaves recipe, just click here. 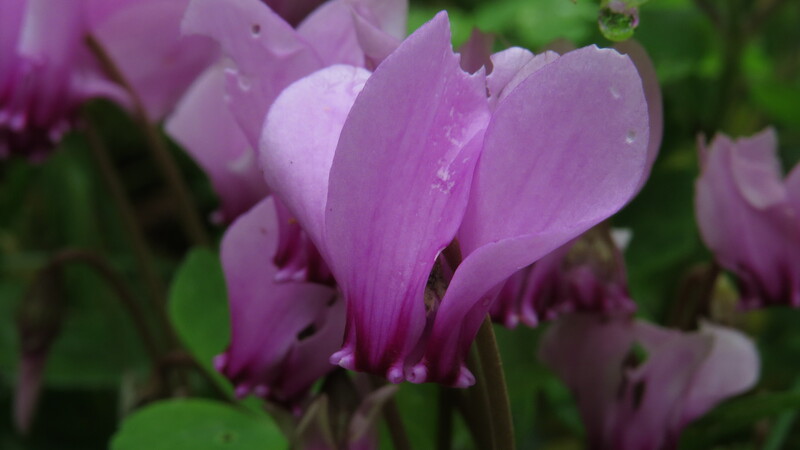 From Sue Eland’s ‘Plant Lives’ website I learn that, in the language of flowers, cyclamen is said to represent voluptuousness, diffidence and goodbye, a rather difficult combination to carry off I would have thought. A small cake made from the plant and baked will cause paroxysms of love in whoever eats it. 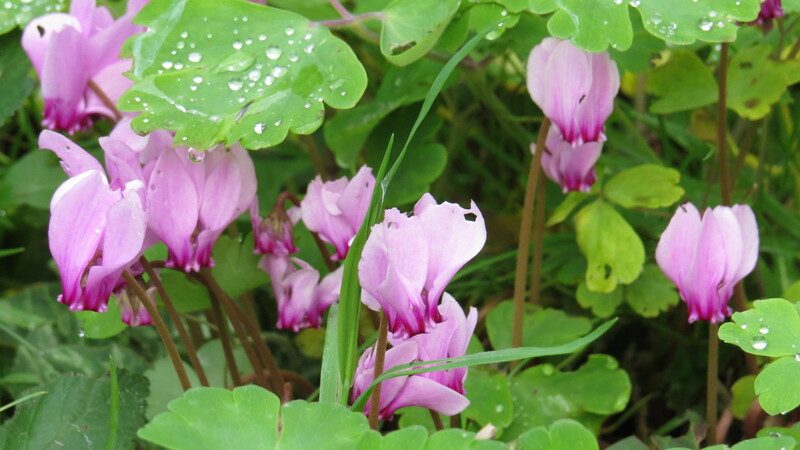 The plant is said to offer protection from the ‘evil eye’ (and its close relative, Cyclamen persica, has been a house plant for centuries), but if a pregnant woman stepped over a cyclamen it was believed to cause miscarriage. If it appears in your dreams, it is a sign of calamity. All in all, it appears that you never know where you are with a cyclamen. 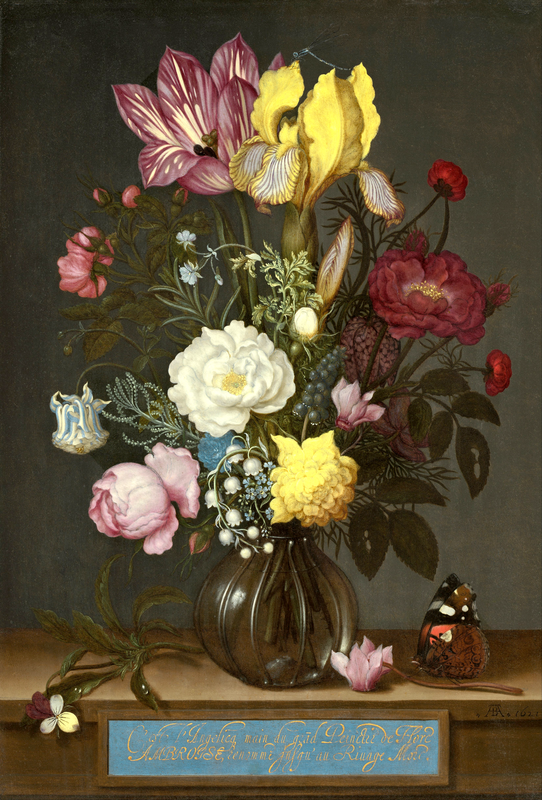 As you might expect, the unusual form of the cyclamen made it a favourite with still life painters, such as the remarkable Ambrosius Bosschaert the Elder, who worked in the Netherlands during the 17th Century. However, they have also inspired more recent painters. Koloman Moser, whose painting is below, was a member of the Viennese Secessionists, a group that included Klimt. The plant was to be a big influence in Art Nouveau generally, with its love of the natural world and the exotic. And I can see why people were influenced to record the fleeting beauty of cyclamen. To see those flowers, poised as if to take flight, amongst the fallen leaves of autumn is to experience a brief moment of wonder. Images of paintings in Public Domain. All other photos copyright Vivienne Palmer. Free to use and share non-commercially, but please attribute and link back to the blog, thank you! This entry was posted in London Plants on November 2, 2016 by Bug Woman. Fascinating I too love their recurved petals they remind me of Piglet’s (from Winnie the Pooh) swept back ears!! I have an abiding memory of a whole wood full of them in Yugoslavia, that is going back a bit! I would have loved to have seen that, Toffeeapple! They smell divine… but so tiny you almost have to lie down to get your nose near enough!